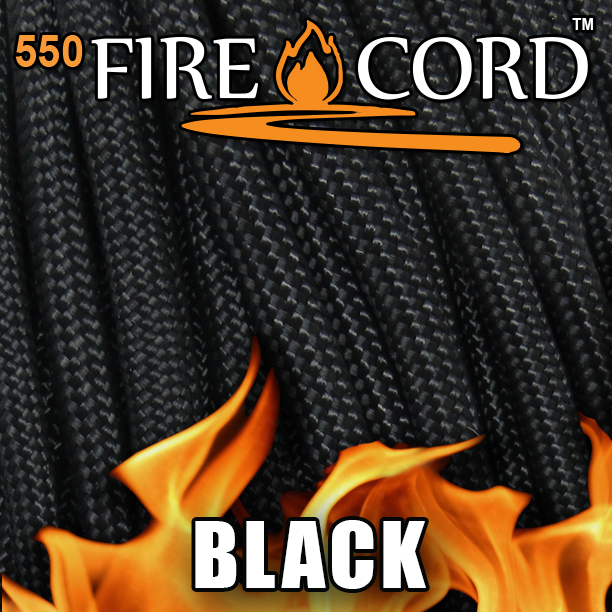 100 feet of black 550 FireCord by Live Fire Gear™. FireCord is similar to regular 550 paracord but in addition to the seven inner strands an additional "fire tinder" strand has been added. The fire tinder strand can be removed and used as tinder when a fire is needed. 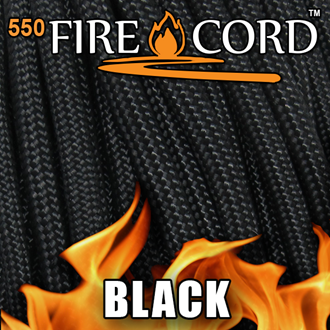 The good folks of Live Fire Gear™ took the popular 550 parachute cord and added an extra strand of waterproof “Fire Tinder”. 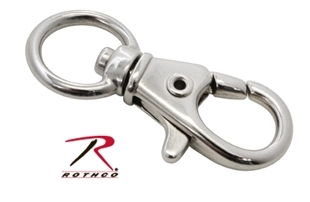 This 8th strands can be pulled out of the cord and used in the fire making process, meaning this cord the perfect replacement for zipper pulls, bracelets, lanyards and other items. Survival paracord crafted projects often have additional survival tools such as flint lock buckles, compasses, etc. added to make the item that much more survival functional. By making your next survival paracord project out of 550 FireCord, your survival item will be even more survival ready. return or use the paracord (now with the “Fire Tinder” removed) as you would normally. On your next survival paracord project make it with 550 FireCord to provide an additional level of survivability. One common question is: If it contains ignitable “FireTinder”, how do you melt the end to prevent fraying? To prevent fraying, you melt the end just like you would with regular paracord. The slow burning nature of the “Fire Tinder”, plus the fact that it is wrapped with the other strands and casing ensures the end of the cord will melt similar to regular paracord.